The June Long Weekend is a time to get some shiznit done around the house. 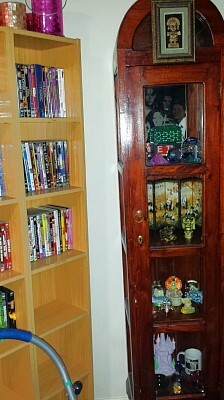 I kicked it off on Friday, cleaning my DVD shelves and one of my collectible cabinets. Last week there was an incident, where I fell off my little yellow stool I usually stand on to light my candles, so some sturdy steps are now in place. I love my DVD shelves but I do not love the dust that tends to collect on them, not at all. I sometimes think maybe I should just make them all into digital files and then pack them away, but that is a lot of effort to go to, and dusting them is probably simpler, quicker and easier. I still have more cleaning to do -there is another glass cabinet full of awesome – I really want to photograph everything that is in these cabinets one rainy day soon. but as Saturday was a sunnyish afternoon, we headed outside. Me to pick up fallen branches and sticks after some windy weather, the other half to mow the lawns. 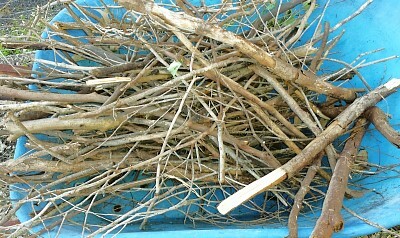 I also spent some time pulling down branches from the top of the chook pen. There is an entire ecosystem going on up here which would never have existed without my Redcomb meeting that hawk. There are orb weavers, leaf spiders, silk worms and caterpillars making homes safely away from pecking beaks. If the chooks could get up here they would have a fantastic meal. 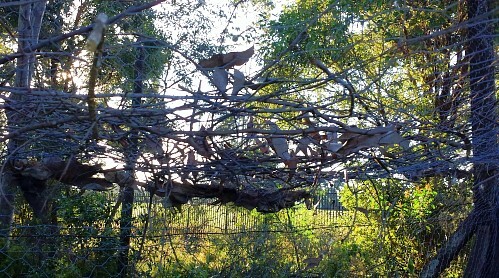 Unfortunately – well, fortunately for the ecosystem – they can’t, and those branches are pushing the chook wire down and needed to be removed, or at the very least, some of them did. I tried to remove the webs and spiders first in the hope of not getting them on me.. :) Also so they would not become barbecued spiders later in the day because a trip to Bunnings to buy a fire pit was on the afternoon agenda. Nobody likes a barbecued spider! First we stopped in to pick up a new SodaStream as ours broke. We don’t use much in the way of syrups at all – I am much more likely to throw in some fruit and call it awesome. I’ll have to do a post on some of my favourite combos. They were on special for $48 at Harvey Norman which was pretty decent and it came with a c02 bottle, a new reusable SodaStream plastic bottle for the water to chill in, plus two syrups – lemonade and cola – which The Other Half might use. 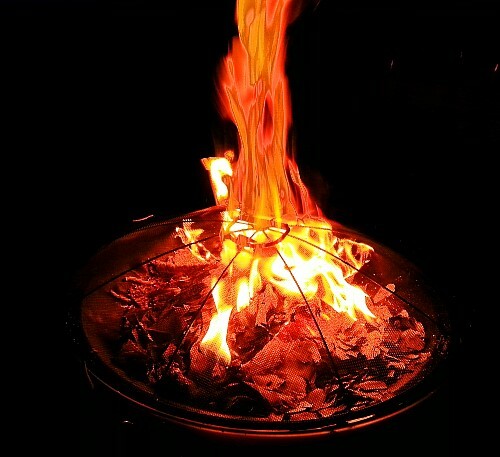 The Other Half has wanted a fire pit for a while. Of course by the time we went to buy the one he liked, they were all gone. We’ve ended up with something slightly more expensive but he is happy and this will mean a lot of the fallen branches can feed that caveman fire desire rather than heading off to the dump in the ute, and keep The Other Half warm while he’s outside with his telescope at dark time. We need to redesign our pond completely, but I think that is a job for summer. :) Yay for pizza and fire pits! ;) Hope it was tasty..
I’ve never heard of a SodaStream and was fascinated with that. 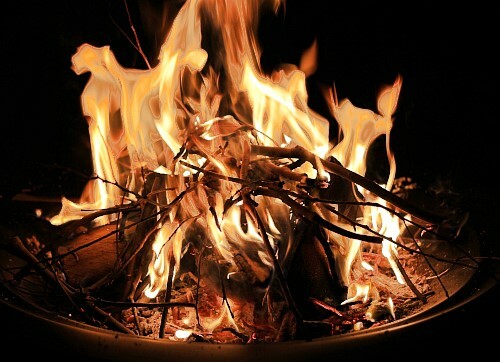 I love fire pits; they remind me of camping, which we did frequently when our girls were small. Dusting is my LEAST favorite task! 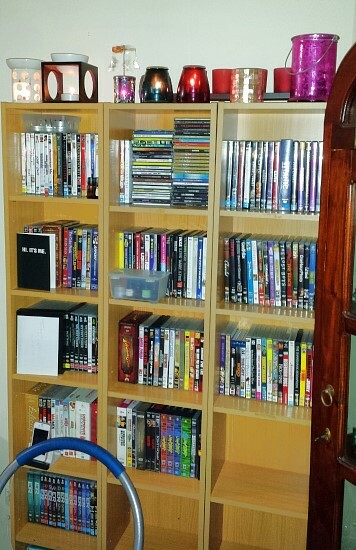 I love your dvd shelves too, are they from Ikea? I want fire pit shaped bowls on stands for my garden, for miniature succulent gardens to sit in amongst the ground plantings. I think assorted bird baths will do the trick. Of course, you may have picky friends who like to nose around and say to one another “Did you see the dust on the TV? You could write your name in it.” But I don’t have picky friends. In fact I don’t have friends, period. So that’s all right, then. Plus which I always know where everything is. It’s in the corner where I threw it last time I looked at it. 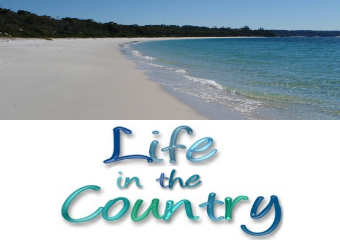 We had a tourist invasion so going anywhere local is pretty much off the cards. I drink 2l of soda water a day, I’m an addict.. :) I prefer it to regular water! I’ve been doing a little organizing too. I am not very good at dusting though. I quit doing a lot of it due to time and there being so much to dust! lol But I gotta! And windows too. Hope you are doing well and staying away from the spiders. I hate them too! I am doing very well at the moment, yay! :) We discovered a large nest of the creatures you speak of, coincidentally out near the pit for services at the front of the house. All exits were closed off, and much insect spray was used, and no further exits appeared which means the spray worked. 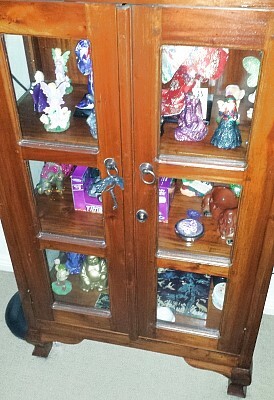 I want to know what’s in the glass cabinet full of awesome.